No word has been looked up more often this year in Merriam-Webster's Online Dictionary. Incumbent, electoral, insurgent, hurricane, cicada, peloton, partisan, sovereignty and defenestration (!) are numbers 2 through 10. This is a minuscule story in the US but a huge one up here. 24-hours news channels are covering this intensely. Anyways, since Canadians are generally anti-Bush (the same way most countries around the world are) they're preparing a pretty important protest in front of the federal Parliament. 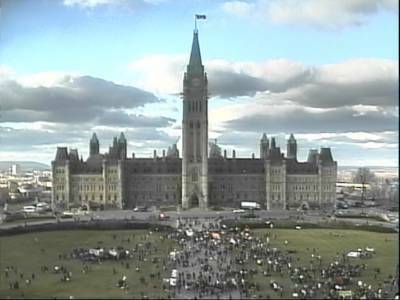 The Hill Cam shows the real time gathering. Heh. This is a picture that was saved a couple of hours ago. The Globe and Mail tells us this morning that a whole bunch of PR/crisis counselors agree with me that the Canadian Imperial Bank of Commerce (commonly known as CIBC) is screwing up it their treatment Wade Peer, the scrap dealer in West Virginia that received all that confidential information. At least the headline is amusing. L'idée de Marie-Chantal est presque devenue un Tout le monde en parle des carnetistes montréalais branchés (incluant Sébastien Paquet, Michel Dumais (qui s'offre comme organisateur en chef), Sylvain Carle, Martine Pagé et plusieurs autres). Un wiki et un blog (avec un fil RSS) sont déjà en place. Do you think you are at risk of losing your job in the next year? 28% of Canadians say yes. Out of the 18 countries Right Management Consultants surveyed, we're 16th on the optimism scale (only Hong Kong and Germany fare worse). The UK edition of PRWeek writes about it, so do Robert Scoble and Shel Holtz. Tell us what you really think there Rupert. Let me start over. Rupert Goodwins is a columnist at ZDNet UK. In his latest comment, he skewers a PR agency for sending out a media release printed on a t-shirt. Yes that's right, printed on, not accompanied by. We' ve had some daft things through the post here. A couple of years ago around this time, we got a set of loose fireworks as part of a PR campaign. We're not sure how legal that is -- oh, who are we kidding, we know exactly how illegal that is. But the office is festooned with cuddly chameleons, stuffed penguins, comedy hats, half-empty bottles (they don't stay that way for long), novelty mouse mats, novelty mice, half-full USB key drives (this year's toy of choice) and many other PR gizmos ranging from useful to tasteless. T-shirts are a perennial favourite. The best ones are big, black and have discrete logos -- which is why most of them are small, white, festooned with ugly designs and useful only as underwear. However, I have in front of me what must be the least good idea in promotional T-shirts. Ever. The least good idea? (How about the worst idea?) Anyways, does anyone know any worse idea in promotional t-shirts? If so, email me or leave a comment. The IBM Press Room now offers its content via RSS feeds. (To) the heartland, Bush is Reagan. The vast red states are more than metaphor. They're the country. The intellectuals — including, I would guess, most of us here in the blogosphere — are the fringe. We're a minority that did about the best it could do, considering. We tried to "take back" the country. But it wasn't there for the taking. And that, my friends, is spin. The New York Times writes that Advertisers Learn From Candidates. Frontline, PBS's flagship public affairs show is presenting "an in-depth look at the multibillion-dollar "persuasion industries" of advertising and public relations and how marketers have developed new ways of integrating their messages deeper into the fabric of our lives" and not one PR executive accepts to go on the program! Kevin Roberts, CEO of Saatchi and Saatchi Advertising, Doug Atkin, of Merkley + Partners, and Naomi Klein are all part of the piece that'll be aired November 9th. News release is here. Thanks to Jeremy Pepper who got it from O'Dwyers. So marketers want consumers to be in control, do they? "Truly the consumer wants to be in control, and we want to put them in control," General Motors marketing executive Roger Adams told the Association of National Advertisers' annual meeting. Be careful what you wish for. What most marketers haven't come to grips with is just how much consumers are now calling the shots. They have the ability to change the way ad messages are being received -- and even come out with their own counter-messages. Well, he is right. Most marketers haven't come to grips with how much consumers are calling the shots. Maybe it's time they wake up and smell the coffee.